• DESCRIPTION: Revealed at last: how it all ends for the Man Without Fear! In the near future, the Kingpin and Daredevil have been murdered - but that's just the beginning. Reporter Ben Urich has one last story to write: What was Matt Murdock's final secret? Ben digs deep into the seedy underbelly of the Marvel Universe, tracking down Matt's buried sins and past loves to discover the secrets behind his death. But who is the new Daredevil that's tracking Ben? The investigation leads Ben through a harrowing gauntlet of Daredevil's greatest foes - and straight to the Church of the Hand! And when Daredevil's final mystery stands revealed, Ben Urich's life will never be the same! It's a story years in the making, brought to you by some of the finest creators in Daredevil history! 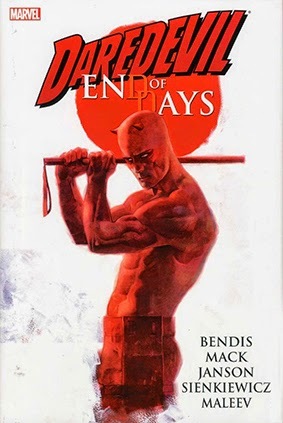 Collects Daredevil: End of Days (2012) #1-8. Written by Brian Michael Bendis and David Mack. Art by Klaus Janson and Bill Sienkiewicz. Hardcover, 7 1/2-in. x 11-in., 216 pages, full color.